CHICAGO – A recognized leader in animal care and conservation, Chicago’s Shedd Aquarium announced today that it has welcomed a 10 -week-old orphaned southern sea otter pup (Enhydra lutris nereis) to the aquarium as part of a collaborative partnership with Monterey Bay Aquarium – a leader in the conservation and rescue of the threatened marine mammal species. Now weighing at about 11 pounds, the female pup arrived at Shedd on January 27 from Monterey Bay Aquarium in Monterey, California, where she was estimated to be 4 weeks old. 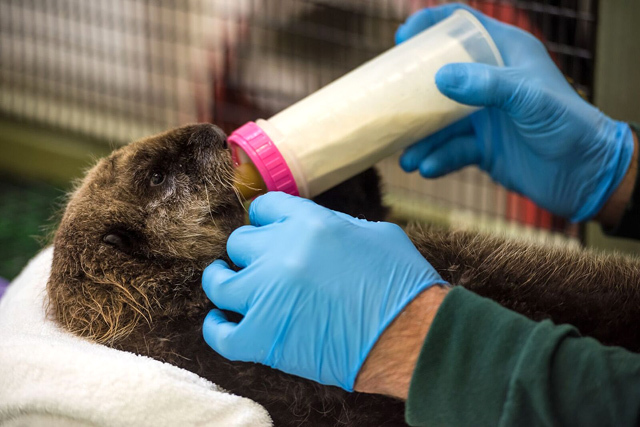 The pup is receiving care behind the scenes in Shedd’s Regenstein Sea Otter Nursery from a team of dedicated animal trainers and veterinarians. She is the third pup from the threatened southern sea otter population to reside at Shedd. “Pup 719” –which refers to the number of otters taken into Monterey Bay Aquarium’s Sea Otter Program since its inception in 1984 – is currently achieving critical milestones in her growth. As she acclimates to her new surroundings at Shedd, Pup 719 continues to achieve many important milestones and advancing her skills which include eating solid foods such as shrimp and clams, foraging for food, grooming on her own and interacting with Shedd’s animal care team. Rescued southern sea otter pup 719 in the care of Monterey Bay Aquarium Sea Otter Program staff member, Karl Mayer, and Shedd Aquarium trainer, Michael Pratt. The pup was found alone on Jan. 6 on Carmel Beach in Carmel, California. Monterey Bay Aquarium’s Sea Otter Program staff, who are first responders for stranded sea otters, were alerted to the stranding by local animal control officials. After an unsuccessful attempt to locate the mother through the pup’s cries, the little otter was brought to the aquarium’s veterinary intensive care unit. She was given a thorough exam and estimated to be four weeks old based on development of her teeth, her size and behavior. The Monterey Bay Aquarium’s Sea Otter Program has been studying and helping recover the threatened southern sea otter since 1984. 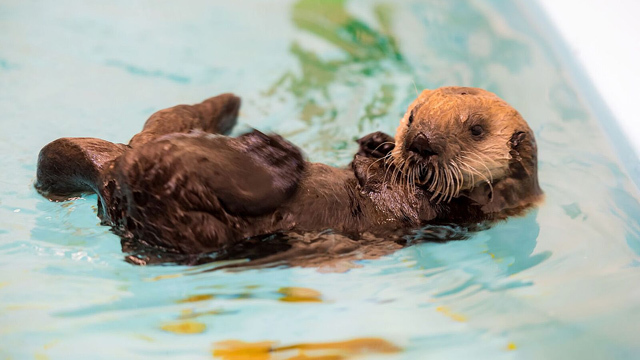 The program works with wildlife rescue facilities and other aquariums, such as Shedd, to respond to every sea otter that comes ashore in distress along the California coast. The rescue is another success story in the continued partnership between Shedd and Monterey Bay. In 2014, the aquariums partnered to rescue Luna, a stranded sea otter that needed intensive care and rehabilitation due to her very young age. When she arrived at Shedd, animal care staff taught the pup “how to be an otter,” helping her reach critical milestones like foraging for food, grooming herself and regulating her body temperature. Southern sea otter (Enhydra lutris nereis) pup 719 being bottle fed by Sea Otter Program, Research and Conservation staff member, Karl Mayer, at the Monterey Bay Aquarium. The International Union for Conservation of Nature (IUCN) classifies sea otters as threatened on its Red List due to the slow recovery of southern sea otter population in California. Today, while California sea otters are at 95 percent of the number set by federal officials as a recovery goal, they remain vulnerable to the risk of a major offshore oil spill. Population growth is limited by white shark predation and limited food in their narrow coastal range. 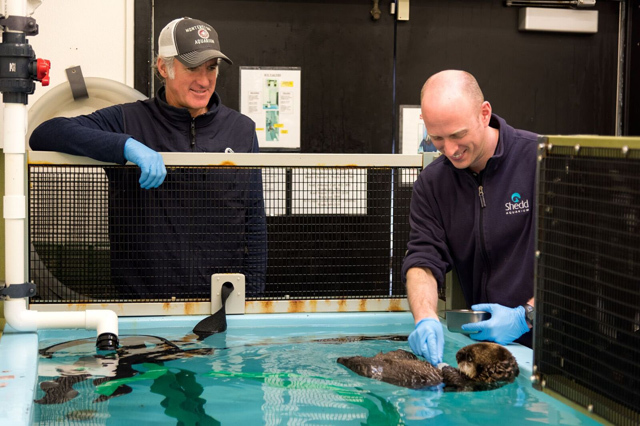 With a long history of involvement with marine wildlife rescue projects, Shedd Aquarium is one of the first institutions to conduct training with sea otters to further improve their care and long-term management. After the Exxon Valdez oil spill in 1989, Shedd participated in the wildlife recovery efforts and took in four orphaned pups. The aquarium is now recognized as an expert in rehabilitating sea otter pups. All but one of Shedd’s five sea otters have been rescues, and Pup 719 is the third southern sea otter that came through Monterey Bay Aquarium’s Sea Otter Program.